Habit: Acacia choriophylla grows as a medium sized tree up to 10 m in height with a trunk to 40 cm in diameter and has no spines. The trunk is brown with whitish fissures/cracks in the outer layer of the bark. The bipinnate leaves are arranged alternately with small stipules at the base of the petioles. There are 1 - 3 pairs of pinnae each with 4 - 10 pairs of leaflets. The leaflets are dark green, to 1 cm in length, oblong with an obtuse or emarginate leaf tip and entire margin. The actinomorphic flowers are arranged in tight, axillary or terminal, globular heads with each flower subtended by a bract. There are 5 fused sepals in the calyx forming a shallow tube. There are 5 fused petals in the corolla forming a tube that exceeds the calyx. There are numerous, orange/yellow showy stamens that are 2 times as long as the perianth. The ovary is superior with a single locule. The fruit is a legume that turns brown at maturity and is up to 6 cm in length. The seeds are embedded in a white fleshy pulp. Habitat: Acacia choriophylla grows in Dry Broadleaf Evergreen Formations- Forest/Shrublands (coppice), Pine Woodlands, as well as sand dunes and in human disturbed areas. 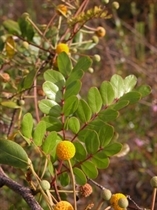 Distribution in Bahamas/Globally: Acacia choriophylla occurs on all island groupings within the Bahamian Archipelago as well as the Florida Keys and Cuba. 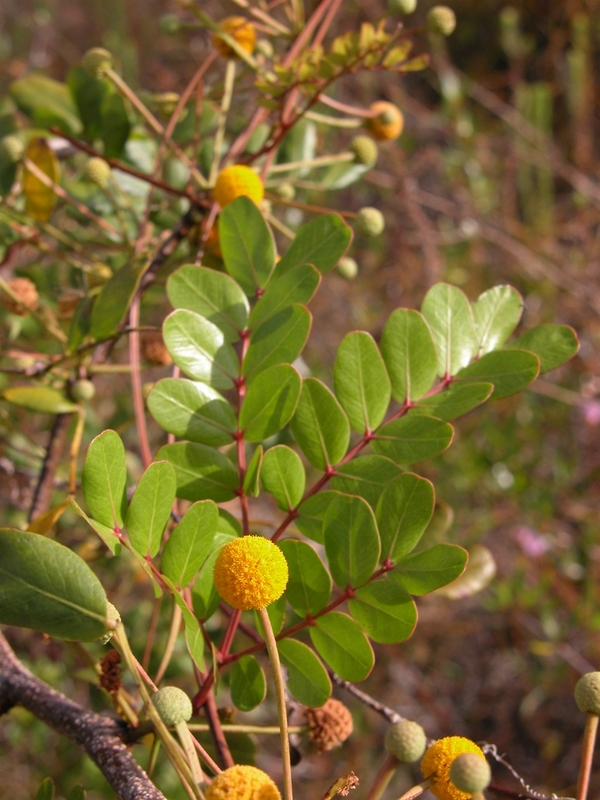 The pulp surrounding the seeds is edible but Acacia choriophylla has no known medicinal use in the Bahamas.